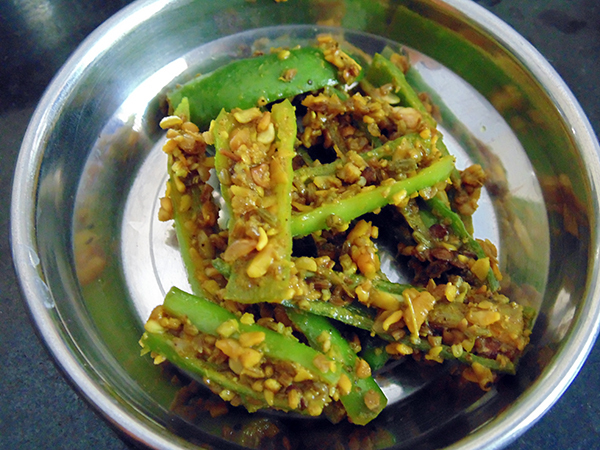 Athela Marcha (Green Chili Pickle – Hari Mirch ka Achar) is awesome recipe to add delicious taste in any meal. This spicy & tangy pickle is easy to made and taste amazing. It can use with any mean specially with Khichdi or Kathiyawadi meal. I always kept Green Chili Pickle in my refrigerator. Mustard seeds, Fenugreek seeds, Fennel seeds and lemon juice adds delicious tangy and spicy taste in Raita Marcha. Wash and cut chili into long strips. Mix mustard seeds, fenugreek seeds, fennel seeds, salt, asafetida and turmeric powder. Now heat oil in a pan at slow flame. Add hot oil in masala and mix well. Mix this dry masala with chili. Last mix lemon juice in it. Mix well store in a cool place. Athela marcha is ready for serve. You can add few drops of citric acid as a preservative. Athela marcha a very simple but dilicius recipe ! I want to know the recipe of LASANIYO MASALO Please help me if you can, thanx ! I love your postings. Married to an Gujarati I try to spoil him always with recipes from his home place. Can u plse explain split….seeds? I only saw full. Do I habe ro put them into a blender for a second? Thanks for reply! Split seed is easily avail in grocery store. Ask for Rai na Kuria. Cld you pl explain what you mean by ‘SLIT’ mustard seeds. Mustard seeds is ‘rai’in gujarati , how do u slit it??? Sorry, there were typo. Split mustard seeds means “Rai na Kuria” in Gujarati. You will easily find at Indian Grocery store. Thanks for pointing it.